Angus Wynne Jr. had a vison unlike any seen before in Dallas. After World War II, he began work to transform 820 acres of farmland in Oak Cliff into a completely planned $25 million community. Aptly named Wynnewood, it was ahead of its time in 1946 and was the largest and most comprehensive development ever built in Dallas. The large tract of land was expertly planned by the prominent landscape firm of Hare & Hare with winding streets for 2,220 houses and a 1,000-unit garden apartment community. Central to the development was a shopping area named Wynnewood Village which opened in 1949. Designed to be a regional destination, it had 17 stores with ample room to grow. Architects DeWitt and Swank designed a modern strip building with a new concept—an integral cantilever covering the plate glass storefronts and the sidewalk to protect shoppers from the elements. Within two years, Wynne expanded the strip to fill the first 27 acres planned for the shopping center. DeWitt and Swank designed the expansion by adding on to the original building and locating a second one across the internal circulation road with landscaped median. Parking was key with ample spots in front of the stores and lining the circulation roadways. The expansion followed the original cantilever design with corrugated fascia panels. New, though, was an elegantly sculpted curve underneath the cantilever which met an oppositely curved metal channel above the storefronts. The addition of lights beautifully illuminated the cantilever curve at night. To provide entertainment, a 1,000-seat movie theater—designed by prolific movie house designers Pettigrew and Worley—opened in 1951 behind the stores, featuring a neon marquee and tower with “Wynnewood” illuminated at night. Unfortunately, it was demolished in the 1990s. 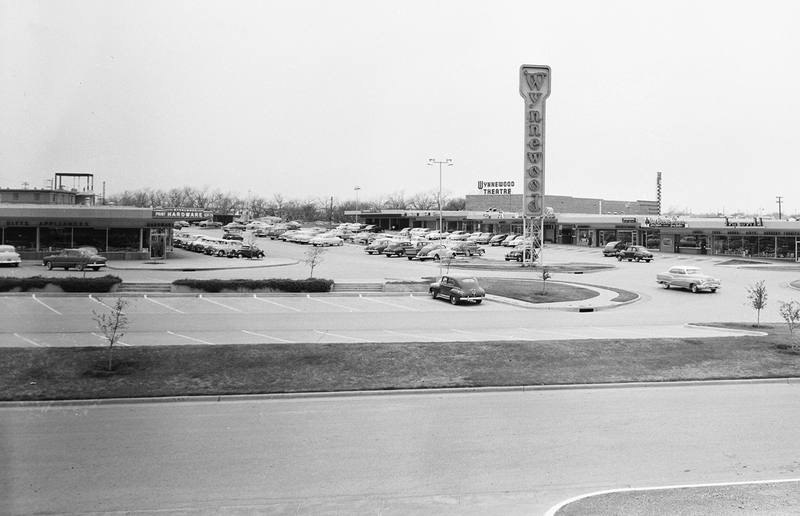 The expansion also allowed Volk’s department store to open its first location in Oak Cliff. To attract shoppers, it included a family of four monkeys living in a specially-conditioned glass house. To compliment the retail, several free-standing buildings were built for non-retail services. In 1951, the two-story Wynnewood Hotel, also designed by DeWitt and Swank, opened with 73 ultramodern rooms. They also designed a two-story medical and professional building in 1954 with amenities such as air conditioning and a music system for relaxation. Both have been demolished. Wynnewood State Bank moved into a new free-standing building in 1959 which featured a new banking trend—the drive-in window. Architects Robert Alexander and Will Scott Richter prominently located the drive-in windows on the front of the building with a direct view into the glass-fronted lobby and a glass-walled community room above. Architect Dale Foster expanded the building in 1965 with a second floor and even an outside walk-up teller window. Outliving its usefulness, the building is now doomed with demolition. 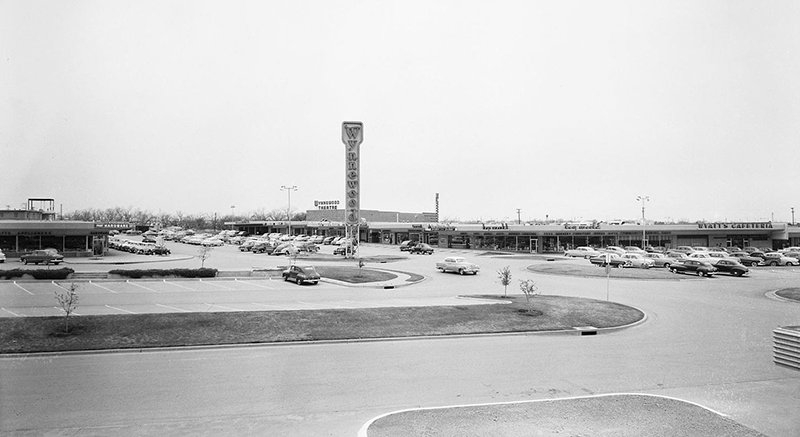 Montgomery Ward built a free-standing two-story store in 1956, leading the northward expansion of the shopping center. It was demolished in the 1990s. Two additional sections for retail were added in 1960, carrying forward the same 1951 design for a cohesive look. The new sections allowed Wyatt’s Cafeteria to relocate from the earlier section to a larger location, and for Titche’s to open its third store in Dallas. 1954 photograph of Wynnewood Village / Courtesy: Squire Haskins Photography Collection, Special Collections, The University of Texas at Arlington Libraries, Arlington, TX. 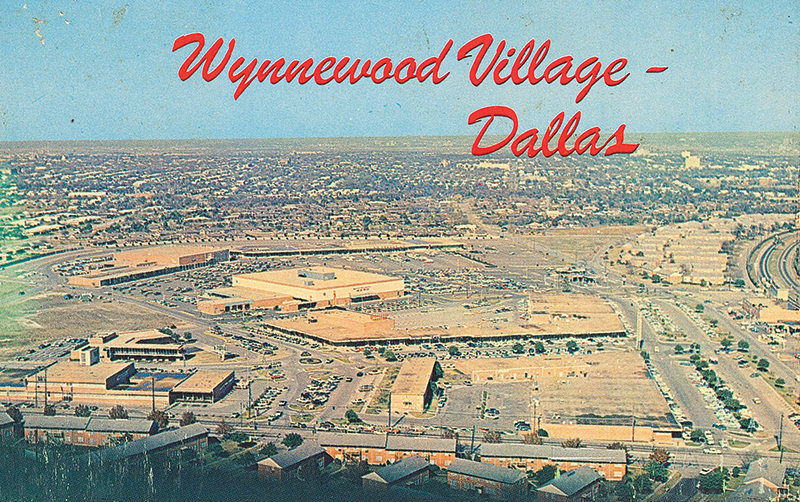 By 1970, Wynnewood Village had over 104 stores spread out over 59 acres, making it the largest open-air shopping center in Dallas. The decline of the center started, though, in 1975 as major tenants moved to the newly-opened Red Bird Mall only five miles away. Wynnewood Village was a trendsetter in commercial development, ushering in the era of the strip center with its unified design and covered walkways now prevalent all over Dallas. The DeWitt and Swank design was cutting-edge and the layout of the center made it highly successful until the shopping mall rose in prominence. The current owners have redevelopment plans underway for the site that include additional retail space, a new multiplex movie theater, and a “new façade” for the original portion. Hopefully, DeWitt and Swank’s timeless design will be honored in helping to bring back Angus Wynne Jr.’s vision of Wynnewood Village as a regional retail center. David Preziosi, AICP is the executive director of Preservation Dallas.